WEST MIFFLIN, Pa., April 2, 2019 /PRNewswire/ -- This April marks the 12th annual National Safe Digging Month, reminding Pennsylvania residents to always dial 8-1-1 three business days before any digging project. National Safe Digging Month is formally recognized by the U.S. House of Representatives and Senate and has traditionally earned the support from nearly every state governor across the country. Within the Commonwealth of Pennsylvania, National Safe Digging Month is also supported by almost 200 local government entities: cities, townships, municipalities, and county governments. April is National Safe Digging Month! Know What's Below. Call 811 in advance of any digging project such as installing a mailbox post, planting a tree, or installing a new fence or deck. What's Below? I don't know! Call 8-1-1 before you dig. When dialing 8-1-1, homeowners and contractors are connected to Pennsylvania 811, the local one call center, which notifies the appropriate utility companies of their intent to dig. Professional locators are then sent to the requested digging site to mark the approximate locations of underground lines with colored flags, paint or both. 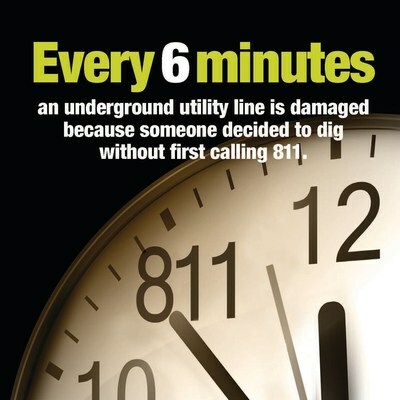 An underground utility is damaged every nine minutes because someone decided to dig without first dialing 8-1-1. Striking a single line can cause injury, incur repair costs, fines and inconvenient outages. Every digging project, no matter how large or small, warrants a call to 811. Installing a mailbox, building a deck and planting a tree are all examples of digging projects that should only begin three business days after a call to 811. "As April marks the traditional start of digging season, we are using this month to strongly encourage individuals and companies to dial 8-1-1 before they begin digging," said Bill Kiger, President & CEO. "By dialing 8-1-1 three business days in advance to have the underground utility lines in their area marked, homeowners and professional excavators are making an important decision that can help keep them and their communities safe and connected." The depth of utility lines can vary for a number of reasons, such as erosion, previous digging projects and uneven surfaces. Utility lines need to be properly marked because even when digging only a few inches, the risk of striking an underground utility line still exists. 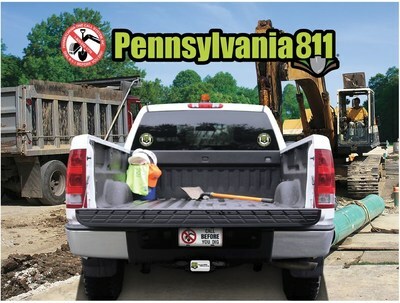 Pennsylvania 811 encourages residents to visit www.pa811.org or www.pa1call.org for more information about safe digging. SOURCE Pennsylvania One Call System, Inc.